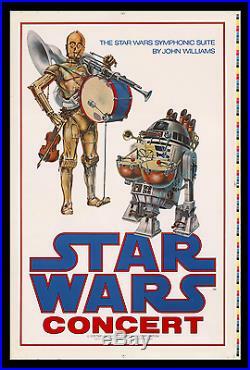 THE 1978 STAR WARS CONCERT POSTER. It's been called THE Holy Grail of Star Wars Posters. It's now become THE Holy Grail of Star Wars. That's right, because up and until recently, this Printer's Proof didn't exist anywhere within the known Star Wars collecting universe. There was legend of it (said to be in LA), but no one was able to pin it down on a map. Printer's Proof enthusiasts, like myself, have been putting forth a concerted effort to track down an original for more than thirty something years now. After scouring through many fields of folly, suddenly and surprisingly, I found the real McCoy. And now you've found it, or, it's found you. Barely existing in any form, with only a few dozen [machine-cut] finals surfacing since the end of the 1970s, "The Star Wars Concert Poster" has always been. Surrounded by a litany of. I say "living" because it keeps changing to some degree as new information surfaces. The discovery of this 1-of-a-kind Printer's Proof has provided yet another push forward to the story. I know that there are a number of astute collectors out there who are diligent about doing their homework. That is, whenever they're about to consider a serious acquisition. If you're such a person, or if you're someone who's just interested in the inside info - read on - because you're likely not going to be aware of all of the new and relevant history involved in the making of "The Star Wars Concert Poster, " and no doubt this even more elusive uncut Test Proof, and so here's a full report on the product at hand. THE STAR WARS SYMPHONIC SUITE BY JOHN WILLIAMS. Despite considerable planning, lots of talk throughout the Star Wars community, and, legal expenditures incurred by Fox, the concert series was cancelled. Today, nobody seems to know why. I personally remember that back in 1979, right after the announcement that John Williams was to become the permanent conductor for the Boston Pops, "chatter" about the "Star Wars Concert" became permanently suspended. Before that, I'd heard lots of talk. Needless to say, without the concerts, the poster wasn't distributed to the public as planned. The few originals that now survive have all come from either the artist, John Alvin, Lucasfilm people, or executives who'd worked at Fox in the'70s. However, I do know of at least a few originals that were distributed outside of that realm. In the early 1980s, there was a John Alvin hand-signed original that made its way into a radio contest as a top prize. It was won by a child listener. 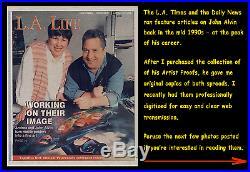 I was told that Lucasfilm or Gary Kurtz (Star Wars producer) consigned the posters. THE CONCERT POSTER'S RISE TO FAME. Christmas to be exact - that's when this poster image first became popularized throughout the general public. Millions of first generation Star Wars enthusiasts, and their siblings, saw its full-page reproductions in "The Art of Star Wars" and in The Star Wars Poster Art Calendar. Both were smash hit gifts given during that holiday season. Subsequently, those two Star Wars presents became among the most widely distributed and largely seen print works released during the 1970s. By 1985, when Lucasfilm authorized the first official "Star Wars Checklist Poster, " almost every collector had already amusingly familiarized themselves with the "Concert Poster" through those two publications. I can attest to the fact that long before "The Star Wars Checklist Poster, " "The Concert Poster" was already atop most advanced collector's personal want lists. Nevertheless, the release of the "Checklist Poster" had a profound and lasting effect over the widespread desirability and perceived value of the Concert Poster. By way of attrition, the "Checklist Poster" served nicely to educate collectors on the extreme rarity of the Concert Poster. That fact notoriously spread throughout the Star Wars collecting community, as "The Star Wars Concert Poster" quickly emerged to be the only poster shown on the face of the "Checklist" that collectors couldn't check-off. That status has never changed. After its appearance on the "Checklist, " originals began to realize huge premiums at auctions and in private sales the few times they did appear on the market. By the 1990s, "The Star Wars Concert Poster" had achieved legendary or "Holy Grail" status throughout the Star Wars and vintage poster communities. Its reputation has continued to build in stature over the years, in part, because of the sustained rarity of the originals. Almost four decades later, it's still nearly impossible to find an authentic one. The other part of its immense value is derived from the force of its own charm. Its classic composition, executed by the hand of famed poster artist John Alvin, is simply irresistible. SEEKING OUT THE POSTER ARTIST. 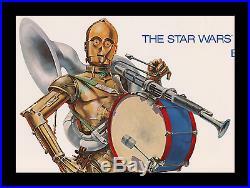 Even though "The Star Wars Concert Poster" wasn't in the collection that I was being offered, I bought the group anyway. Mainly, because I was being told that this set of proofs were coming directly out of Alvin's own flat-files. There were about one hundred signed and dated originals on the price list that I'd been sent. Without omitting any of the duplicates, I bought them all. It worked in the sense that I achieved the direct contact with Alvin that I was expecting, but in the end it was a great disappoint, as he simply had no more to trade - and forget about a proof! He'd never had or even seen an untrimmed "Concert" proof. I made a point to ask him about that first. The proofing stage was already over by the time he got involved in the printing. He said he'd only taken about a half a dozen of the machine-cut finals the day he was on press. He was there to sign off on the project. It was expected that "The Star Wars Concert Poster" would enjoy many subsequent printings. That never happened due to the sudden cancellation of the tour. Alvin's press-day appearance turned out to be the only day it was printed in final form. There were previous printings of just the test proofs. That's a necessary step in getting to the final printing on any job, but there was just the one final printing. Collectively, there were an extremely small number of originals produced. Even with that reality, it was surprising to hear Alvin cry on about how - for years - he tried to get more originals out of Lucasfilm. He was never able to get any movement on that front. He did subsequently achieve a large-scale assignment from the studio; a commission to render three different original paintings that appeared on the one-sheets for Willow, and so he surmised, they [Lucasfilm], may not have had many "Concert Posters" in their supply. I'd have to concur on that conclusion. 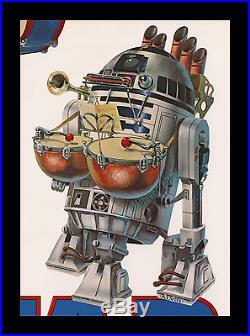 I happen to know that Lucasfilm gave a number of the original "Concert Posters" out to their employees, early on, after the series got scrubbed. That's where almost all of the existing population of originals are known to have come from. I've been able to gather all of this information through the process of trading posters full-time as a profession (no other job) since 1977. Because its been my occupation and avocation, I've been able to sustain an unusual dedication towards obtaining the very rarest of the top collectibles, and, the truth about their origins (not to mention their whereabouts). After thirty-nine successive years of doing this, I can honestly say that I've only been able to secure six (6) of the original 1978 Star Wars Concert Posters! Five of them came from the Lucasfilm people who'd gotten them in that initial flurry. The sixth one (found in that order) came from the fellow who'd won it on the radio when he was a kid. I've had two of my originals safely tucked away since the very beginning, and so that's only left me with four of them to sell in as many decades. Now, that's my definition of a rare Star Wars poster, and forget about the Printer's Proof, that's a whole other level up in rarity! How could it not be? It's a true 1-of-a-kind, as nobody has surfaced with this elusive specimen until now, and that's only because the original owner suddenly passed away. It turns out that the proof was in LA after all. It showed up at an estate sale of a former Lucasfilm employee who'd worked for the studio back in 1978. He recently passed away without his family knowing anything about the small group of Star Wars posters that were found with his stuff. The picker was so excited about the windfall that he made a point to brag to me about how cheaply he'd gotten them. The original Lucasfilm fellow had the foresight to save this "Concert Poster" proof along with three other rare Star Wars proofs; "The Happy Birthday One Sheet, " with the Kenner Action Figures on it, and two other, smaller, Ralph McQuarrie concept art prints of his paintings. He had all four uncut proofs framed on his wall. The four rare pieces constituted the entirety of his poster collection. Still, a remarkably impressive small group, as all four of them stand today as the only surviving printer's proof examples. After careful examination, I determined that all four lithographs were printed together, probably at the same time - definitely at the same print-house! How did I conclude this? Pretty easily; after microscopic comparisons, I was able to confirm that the color-bar strips matched identically on all four posters. The paper stock was also a spot-on a match, and so it was easy to conclude that the set of proofs were all printed on the same machine, which meant it had to be at the same print-house. In my opinion, there's also compelling evidence that they were printed at the same time as well. Even though all four proofs have been stored flat in frames over years, it's clear to see on close-up examination that the "Concert" proof was originally. With "The Happy Birthday" proof, which is also known to have been printed back in 1978. Holding them both together, you can see that the two posters were rolled-up face to face and that the roll got crushed at one point, as if it were pushed into a garbage bin. Luckily, the "Concert Poster" didn't suffer deep enough creases to crack the printing or permanently damage the poster. However, the slight indentations that are on the poster matchup. The creases on the "Birthday, " definitely showing that the posters were rolled-up together, and, crushed together at some point before they were framed. Besides the fact that these two rare Star Wars proofs came from the same find, what directly ties them together are the unique dimensions that they both share. Interestingly, this "Concert" proof and the "Happy Birthday" proof both measure the exact same unusual 25x38 inch size, well short of the 27x41 inch industry standard for an advertising one-sheet. O date, they're the only two of the original Star Wars posters to have surfaced in this size. I've posted a photo of the duo side by side (for reference ONLY), so you can see how they match up (see photo #5). If you look closely, you can see that both Printer's Proofs were found with the original alignment and crop-marks still visible around the perimeters, and so that's proof that these proofs are untrimmed and larger than the intended finals. The 25x38 inch proof size checks out perfectly with John Alvin's sign-off printing on "The Concert Poster, " which was machine-cut down to measure 24x37 inches. However, it doesn't gel with the size of "The Happy Birthday" poster. We all know that was released on May 25, 1978 as a full 27x41 inch theatrical one-sheet. Perhaps it was originally designated to be a commemorative handout? In any capacity, it certainly was a no-brainer that this poster would make a terrific item to display at the movie theaters still playing the film on its anniversary. I personally took measure of the fact that if you were to trim off all four of the white margins on the "Happy Birthday" proof, uneven as they are, the poster would measure exactly the same as the final "Concert Poster, " 24x37 inches. That says to me it was likely designed to be a full bleed (no white borders), which was a very popular format for commemorative and collector's edition posters at the time. For example, all of the Star Wars fan-club posters were issued as full-bleeds. In the end, actually, I think it was the very end - it was finally decided that the "Star Wars Happy Birthday" poster would be an advertising one sheet. Probably the right move, as there still wasn't going to be many theaters playing the film come May 25th, 1978. Star Wars was still enjoying its original limited Roadshow Release on that day. Fox wasn't ready to launch the film widespread into the General Release until July, that's when the "D" style posters were issued into a massive amount of movie theaters along with thousands of newly made prints of the film. On page 21 of "The Star Wars Poster Book" (put out by Lucasfilm in 2005), the authors make a special point to mention how the "One Sheet" designation for the "Happy Birthday" poster came at the very last minute. "Detailed-obsessed collectors have long wondered why the descriptive " Star Wars Happy Birthday One Sheet text in the lower left corner was printed in an unconventional font with a bit of slant. 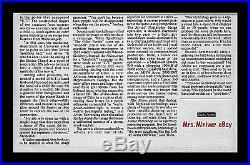 According to Ronald Kalter, who worked as traffic manager for printer Gore Graphics in 1978, the text was slapped on at the last minute using the font off his secretary's IBM Selectric typewriter. The stripped-in plate started to slip in the press, resulting in the signature slant of the text on every poster printed. It turns out it wasn't on every poster printed. As you can see from the photo that I've posted (see photo #5), the infamous slanted "Star Wars Happy Birthday One Sheet" text isn't printed on the bottom of the "Birthday" proof that was found with the Concert. " 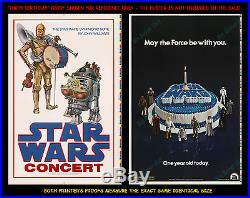 That keen fact, along with all the other matching details that I've already mentioned, is why I believe "The Star Wars Concert Poster" and the "Happy Birthday poster were originally printed together as test proofs. "Together, " meaning on the same day or in the same week - delivered as part of the same work order. That's somewhat backed up by "The Star Wars Poster Book, " at least in their documenting of the timelines. On page 46 of the book, it mentions that the design work on "The Concert Poster" began in the spring of 1978. That makes it possible for both proofs to have been printed on or before the known May 25th "Birthday" release date. Both proofs were found together, printed the exact same size together, on the exact same paper together, and, on the same machine together. I can't say this for sure, but I think they were printed at the same time together. I'll let you draw your own conclusion. What you see is what you get! The images I've posted are direct high-res professional scans of the actual one-and-only "Star Wars Concert Poster" proof. The photos have NOT been retouched. The poster was found in a frame and has since been removed. Originally, the Lucasfilm fellow who saved the four proofs, folded them back as to hide the color-bar strip and extra margin of white paper. He didn't want the printer's marks to show when the posters were framed. Back then, in the 1970s, it wasn't hip or en vogue to display poster proofs. Collectors were turned off by them. Being quite active at the time, I can attest to the fact that any poster with an unusual anomaly, or physical attribute veering off from the cookie-cutter norm, was deemed difficult to sell. Movie poster collecting was a new hobby for most. I remember dealers trimming off the color-bars on proofs in order to be able to sell them. I have to embarrassingly admit, I did that one time myself on an Empire Strikes Back poster. Boy, how times can change, but luckily, this poster hasn't, because the Lucasfilm fellow was smart enough not to have trimmed off what he had carefully folded back. Additionally, he taped each corner to prevent the poster from unfolding when it was framed. I had the four corners of tape he applied professionally removed. That came off beautifully, WITHOUT affecting any of the printing anywhere on the poster. The folded-under pieces unfurled perfectly, and so I made a professional scan of the unrestored poster in its raw state, (see photos #1-5) to document it before I had it professionally mounted by the conservator. The poster can be linen-mounted or paper mounted. Both are valid and secure ways to display and preserve the poster, but, depending upon how and where you're going to display it, you might want the linen vs. I can discuss that with the winner or prospective buyers. All of the poster's minor defects, along with the folds, which are still somewhat visible around the parameter, will flatten out and relax when the poster is pasted down to the mount. 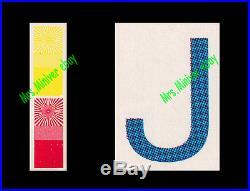 The price of the paper or linen-mounting is included in the sale. Here's no tape or touch-up on the poster, and, there's been no retouching done to the scan! Or paper-backing are accepted forms of poster preservation by the Library of Congress and every Museum in the country. A lot of advanced poster buyers request and prefer mounted posters because it makes framing and displaying the posters much easier - without the risk of damaging the original. The process of backing, which leaves an extra 3/4 inch margin of protection all around, makes the posters much safer to handle - it GREATLY reduces the risk of damaging the originals. Also, all of MY linen-backed posters have been exclusively stored FLAT, and so they DON'T have a curl to them! They're relaxed and ready for framing and display. WE BELIEVE IN TOLERANCE, EVEN TOWARDS THE INTOLERANT. OK all of you curmudgeons; no need to hesitate... Just pucker-up and harpoon this White Whale. Here it is, right in front of you! Get it while it's still swimming around in open waters within reach. Sooner or later, someone is going to snag it. I'll tell you this, on the sooner side, the best attempt at a smooch, or, the wisest man or woman who concludes that it would be pragmatic to just to pay for this piece, will get the prize! We support equal opportunity collecting! That means, no prejudice or favoritism is permitted as a deliberate part of the marketing on this 1-of-a-kind piece. Nothing, and I mean, NOTHING , will prevent you from having this on your wall if you need it placed there! It can crash regardless of any decision you make and can even crash regardless of any decision made by the company related to the stock - Leaving you with a near worthless piece of paper that won't inspire anyone! The magnificence of art and historic documents have an inherent value that relates to civilization and society. Please write with any questions. If you're in the market for top quality original vintage movie posters or Star Wars, then please. Irvine, CA-Craig Kausen, President of Linda Jones Enterprises, Inc. Announced today that renowned movie poster artist, John Alvin, passed away unexpectedly on Wednesday, February 6th. Considered the pre-eminent movie campaign artist of the past 35 years, Alvin's career began in 1974 with his creation of the iconic movie poster for Mel Brook's "Blazing Saddles". He most recently contributed design ideas for the campaign for Disney Studio's Enchanted. In a career that encompassed multiple projects for such directors as Steven Spielberg, George Lucas, Blake Edwards, Mel Brooks and Ridley Scott, Alvin was considered by many studios as the go-to artist for movie poster and campaign art. John Alvin said that his work "created the promise of a great experience" and in that he never failed. Alvin and his wife, Andrea, had recently relocated to New York's Hudson Valley from Los Angeles in order to be closer to their daughter and only child, Farah, a Broadway actress. 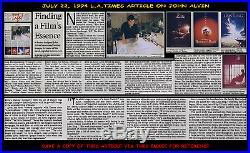 John Alvin said that as a child he eagerly anticipated the arrival of the Sunday paper so that he could peruse the ads for the new movies playing at the local theaters. He was enamored with the magic of film at an early age and would create art inspired largely by his love of film. That passion led him to the Art Center College of Design where he met his wife, Andrea (also a student at Art Center) from which he graduated in the early 1970s. His big break came with the job to create the movie poster for Mel Brook's "Blazing Saddles" in 1974. This campaign led to Alvin creating the images for numerous other Brook's films including "Young Frankenstein". His prominence in this medium was soon after established with his creation of the movie posters for Ridley Scott's "Blade Runner, " Steven Spielberg's E. The Extra-Terrestrial" and Blake Edward's "Victor/Victoria. Not only did Alvin create the movie posters for those particular films, but he also created many subsequent iconic film posters. In all, Alvin created the posters for over 135 movies in a 35 year career. He is considered to be an innovator in this genre. Alvin's work is currently represented in several art galleries nationwide where his original paintings, drawings and limited edition fine art reproductions are displayed. In his recent work, he continued to create iconic images for contemporary films like the Star Wars, Harry Potter, Lord of the Rings and Pirates of the Caribbean series. In lieu of flowers, the family requests that donations be made to the Food Bank Association of New York State or to your local Food Bank Association. The item "JOHN WILLIAMS STAR WARS CONCERT MOVIE POSTER HOLY GRAIL OF PRINTER'S PROOFS" is in sale since Tuesday, March 26, 2019. 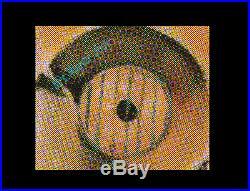 This item is in the category "Collectibles\Science Fiction & Horror\Star Wars\IV\Star Wars".miniver" and is located in Studio City, California. This item can be shipped worldwide.